Cope India 2004 - A "Staged Dogfight"? The conditions of the IAF-USAF exercise in Gwalior did not prove anything in absolute terms. Under certain other conditions, in particular, with massive deployment of electronic support (communications, aerial battle coordination, electronic countermeasures, etc. ), the Americans would probably handle themselves very differently and the Indians would probably not have carried the day. However, the fact remains that after the IAF-USAF exercise and the media blaze surrounding it, the myth of near-invincibility of the USAF has suffered a serious if not fatal blow. Certain American weaknesses in crew performance appeared during the simulated aerial combat. These confirm periodic reports of shortcomings in the capabilities of the American pilots and limitations in their range of action. In general, the judgments made on the conduct of the American pilots in their action against the Indian pilots refer to the "absence of initiative, stereotype attitudes, blind obedience to rehearsed scenarios, lack of adaptability, etc". The American pilots are generally well trained, with very elaborate routines, but the highly structured nature of the training itself leads to a certain predictability in behaviour. This weakness leads one to question the validity of the method, especially like those being experienced. In more general terms, the American pilots operate in highly centralized systems, highly controlled - albeit in a 'sophisticated', low-profile, way i.e. the pilots are centralized and controlled indirectly through procedures and methods that are presented as affording greater freedom of action and effectiveness, whereas in effect, the procedures and methods merely iterate the general pattern. The guiding concept is one a 'system of systems', the reduction of constraint providing the illusion of freedom of action, while buttressing a rigid overall framework that effectively ensures broad general constraint. In 1965, the Americans used high technology fighter aircraft (F-105s, F-4s), with highly automated capabilities (missiles, radar, etc. ), in total disregard of the lessons of the Korean War. During the 1965-68 Rolling Thunder campaign, the Americans encountered serious problems in outgunning the much less powerful North Vietnamese, which was highly distressing for a combatant commanding massive superiority. It was only after a radical change in combat doctrine and tactics, through the establishment of the Top Guns schools in 1969 and through tactics like Dissimilar Air Combat Tactics (DACT) that the Americans succeeded in reversing the situation in the course of the 1972 campaign, where the USAF chalked up 10 enemy aircraft kills for each US aircraft destroyed by the North Vietnamese. These doctrines and tactics had favoured decentralization in all forms: initiative, pilot adaptability, and so on. As from end of the 1970s, the above situation again began to turn against the Americans, under the weight of constraints that involved technical factors (need for control and centralisation of advanced technologies) as well as psychological factors (need for psychological conformity with the American system). Major campaigns were organised annually for highly planned and centralised training, around the concept of Red Flag at Nellis AFB, in Nevada. The idea was to organise vast aerial combat training campaigns with in-depth tactical intervention, under the central control of aerial-electronic surveillance capability, such as AWACS aircraft and its successors. Allied aircraft were invited to participate, with some signing up enthusiastically for the American programme and putting themselves fully under American control (the case for the majority of the countries), by maintaining their national and their independence (the case of the French and the very recent case of India). Often quoted has been Colonel Mike Snodrass, Commander of the USAF's 3rd Wing at Elmendorf Air Force Base, which sent the F-15Cs for the simulated dogfight (at Gwalior against IAF Su-30Ks, Mirage 2000s and modified MiG-21s, the "Bison"). "What happened to us was it looks like our Red Flag air training might not be as good because the adversaries are better than we thought. And in the case of the Indian Air Force, both their training and some of their training was better thn we anticipated". This 'incident' has caused quite a brouhaha in the United States. There was a political and strategic assessment, as well as an operational rundown. In any event, what was clear was that the best fighter aircraft the American "superpower: could field was outclassed in aerial combat by the Indian fighters by a crushing nine wins to one. America was beaten at her own game - advanced technology and aerial combat. A Times of India commentary captured the general feeling, which grasped the meaning of the limits of the exercise, as well as its psychological dimension: "What really happened is as follows: US Air Force underestimated the Indian Air Force pilots and their numerical skills. They thought these are another set of Iraqi or Iranian pilots. The numerical analysis and problem solving capability of IAF pilots are well known and are probably the best in the world. In absence of signal intelligence, satellite guidance and automated software control, the USAF faced Indians who were world class and far superior to their US counterparts. IAF recruits the country's best brains in the Air Force. It is prestigious too. USAF can only recruit as willing average or slightly above average. In addition, in absence of superior communication and jamming, the Indians proved absolutely formidable". The combat superiority edge held by French fighters over their American counterparts had then existed for well over two years: the French aircraft, through their superior range, have been formidable adversaries for America's fighter aircraft for over two decades. but these 'specialist meets', where the Mirage-2000 could very easily outclass the F-15, did not receive much media attention, aside from the highly specialised aviation media where political commentary is non-existent or is expressed in very vague, very conformist terms. The Indian Air Force were themselves reportedly surprised by the publicity surrounding the exercises, even if that publicity was music to their ears. One aspect that emerged quite quickly was the commercial aspect in the field - international competition for the sale of high technology weapon systems. The publicity surrounding these exercises initially stressed the excellent performance of the Sukhoi Su-30 against the American F-15. That is the way the affair was generally presented in the specialised American press. This version of the IAF-USAF "contest" brings knowing smiles to Indian faces. An independent Indian source specialised in military affairs commented: "The very great majority of engagements were carried out, on our side, by Mirage-2000s, not by Su-30s. Certain of the U.S. military were surprised by these errors in the reports on the exercise, which were inspired essentially by American sources.  The few knowledgeable about the details of the competition fully understood". Indeed, it is more advantageous for the Americans to convey the impression that it was Russian aircraft that bested the Americans rather than the French aircraft. Internationally, Russian aircraft are rarely in direct competition with American aircraft, of course. In any event, an obvious 'commercial' effect of the IAF-USAF was the adverse publicity heaped on the F-15 in advance of the Singapore competition pitting the American contender against two European aircraft, the Eurofighter Typhoon and Dassault's Rafale. General Hal M.Hornburg, Commander, Air Combat command, on the lessons to be learnt from the exercise stated: "There is no doubt that some foreign aircraft are 'nearing the capability of ours', and that 'we' are going to be fighting a larger and more capable surface-to-air threat', said Hornburg. 'We need stealth technology and ... other capabilities' of the type that will be provided by the F/A-22 and F-35. Hornburg said that USAF's current F-15s and F-16s are 'still very good', but they are 'becoming dated'." It is easy to understand the situation of the USAF. Its fleet of aircraft is old (the F-15 and the F-16 are airplanes that were designed in 1965-1975, and today it is necessary to develop all the arguments possible to support the new fighter aircraft that are running into so many problems in Congress - especially the F/A-22. 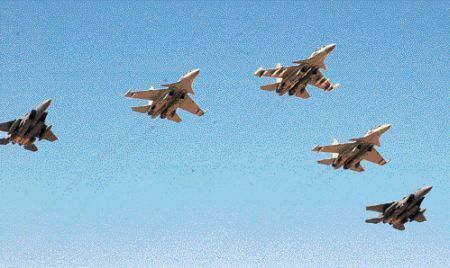 The adverse publicity for the F-15 from the exercise against the IAF becomes an argument for procuring a significant quantity of F-22s on an urgent basis. 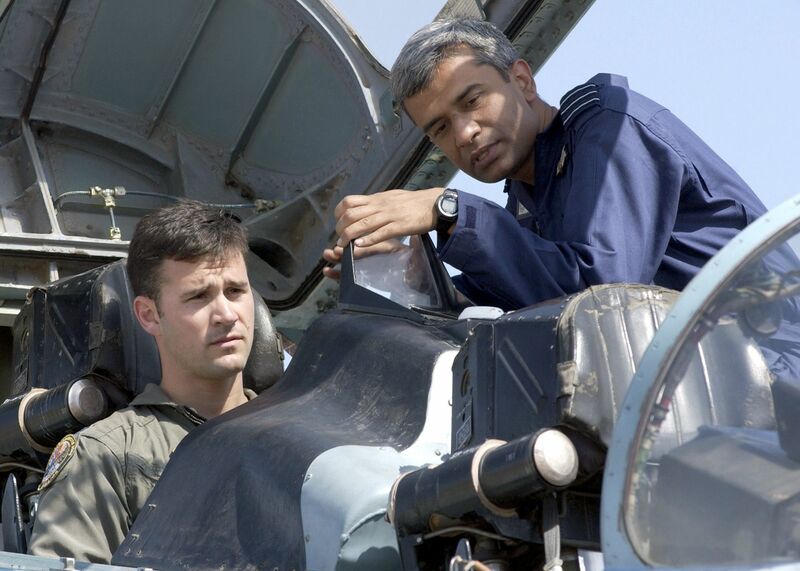 Wing Commander Umesh Rakhra preps U.S. Air Force Capt. Pete Fesler on the Su-30K instrumentation. Beautiful capture of Su-30K SB010, SB017, SB011 and SB016 on ramp. 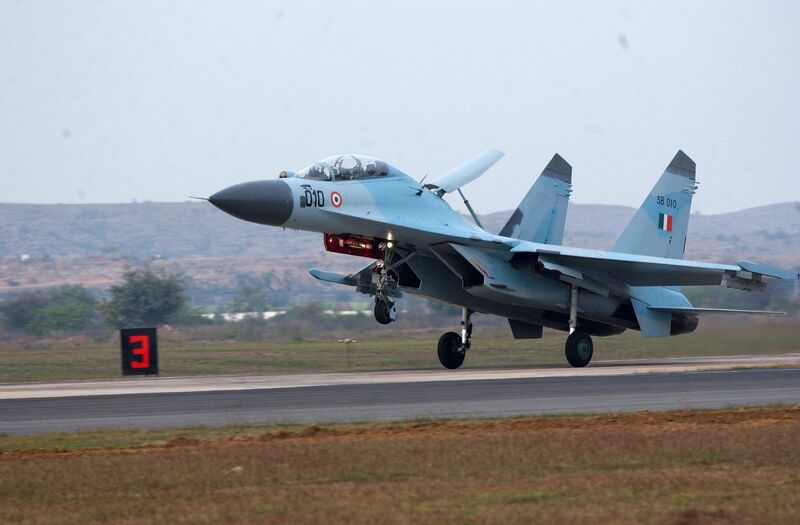 Su-30K SB010 lands at Gwalior AFS. Note the 'Odd Rods' IFF aerials under the nose. 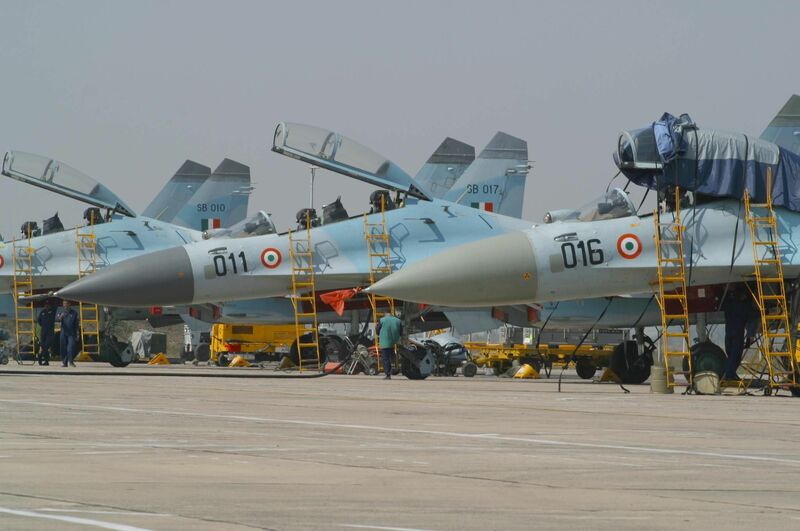 The IAF Today : Ex Cope India article from "Inside the Air Force"